St. Petersburg is one of the most beautiful cities in the world, and its buildings have been seen and photographed a million times. But for those travelers who are slightly more adventurous, there is another option to see the city. St. Petersburg is built on a river delta; it is completely flat. So if you want to get a better view of the cityscape, you have to take to the rooftops. Dmitry, 22, is part of a new generation of Petersburgers who have taken their love for their hometown to the next level. “The roof, it is you. It is the place where your inner world can emerge. Here, you can be yourself, away from the everyday conventions down there,” Dmitry said. “Down there” he works in a bank, but in his other life, he gives tours of the city as seen from above. 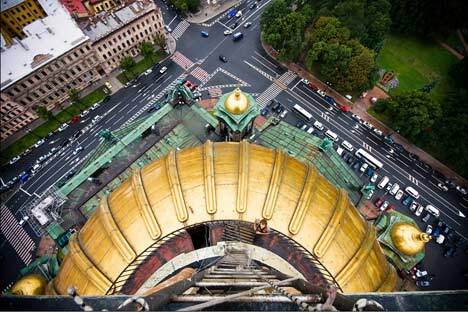 During a three-hour excursion, he might scale four rooftops in the historic heart of the city. The tour might cover less than a mile and a half, but it is like visiting another country. Each roof is different, and offers its own unique landscape and atmosphere. From a building on the quay of the Fontanka River, opposite the circus, you overlook a junction where the winding lines of car headlights and riverboats undulate and interweave in a synchronized dance. Its effect is hypnotic. Near Mokhovaya Street, however, the landscape is quite different. The many chimneys and dormer windows form the framework of a hallucinatory vision. On the horizon, the illuminated cupolas of the city’s great cathedrals – Kazan, St. Isaac’s, Our Savior on Spilled Blood – and the spire of the Admiralty are all aligned, like golden balls set along the tops of the roofs. In the other direction, there is a maze of alleyways and a labyrinth of somber inner courtyards. It is a parallel world, contrasting sharply with the bright lights and non-stop traffic on Liteiny Prospect. A few minutes away, there is what may be the ultimate roof in St. Petersburg – a fashionable building between the Hermitage Museum and the Marble Palace. From here, you get an amazing, panoramic view across the Neva River in all its majesty. To the left, there is the spit of Vasilievsky Island with its Rostral columns; to the right, the Trinity Bridge, like a string of fairy lights and, opposite, the symbol of the city the Peter and Paul Fortress, its spire like a spear aimed towards the heavens. Heights can lead to vertigo, even in those not prone to it. In this case, the vertigo is not so much a bad feeling, as a feeling of power mixed with adrenaline, giving rise to a sense of risk and of what is forbidden. The blocks in the center of the city are no higher than six storeys, and so to get a higher view, roof climbers have to be slightly more adventurous. They climb up dusty granaries, crawl through narrow windows, and struggle across the edges of slippery sheet roofing between the worn-out chimneys. And then there are the guards, the surveillance cameras and watchful neighbors. But enthusiasts say it’s all worth it. Dmitry’s favorite areas “in the clouds” are in the historic heart of the city: Nevsky Prospect, the Fontanka River, the Griboedov Canal, Sennaya Square and Vasilievsky Island and, above all the Petrogradskaya area, which has infinite potential and offers hours of roaming without touching the ground. Roof walking is increasing in popularity, and it is changing as it grows. “In the 1980s and 1990s, you’d meet young, alternative types on the roofs, escaping from the repression all around them. Since the 2000s, the movement has evolved, and new trends are appearing,” said Sergei, a roof-runner with about 14 years’ experience. On one side there are the hardened roof-runners, serious enthusiasts. They seek achievement, speed, target impossible roofs, roofs that are under heavy surveillance, or simply unusual places. On the other side, are the thoughtful types, those who love the city, neo-romantics, who find roofs a place to get away from it all. They go up there to take photographs, to read, to reflect, to sunbathe, and to take advantage of the sense of freedom of the senses. There has also been a notable increase in the number of websites and travel agencies offering walks and organizing celebrations such as weddings and birthdays or photo shoots on rooftops, at widely varying prices. Fancy bars, clubs and restaurants have also capitalized on the trend, setting up their terraces at roof level, taking advantage of the magnificent views over the monuments. It is worth mentioning, however, that to take part in these adventures, it is necessary to respect certain safety guidelines: wear comfortable shoes with non-slip soles, carry a flashlight, keep your hands free and don’t hand on to power lines. One thing is certain, anyone who has spent some time on the roofs of St. Petersburg may come out of it feeling upside down, but will never be disappointed.